Ah! The Chicago Chef Battle. I remember Jill Barron of Mana Food Bar coming in and winning the very first one with her Vegetarian Chili (made with Goose Island Beer). As a meat-eater, I was amazed and had three bowls that night. I remember a few years ago the winning dish was Harvest Ale brined goat, fall squash cider puree, verjus pickled apples & smoked pecans. Last year, Thien Ly of Tank Noodle cleaned up at Salvage One and Jessica Oloroso of Black Dog Gelato served up free Root Beer Floats. It was those floats that inspired this year&apos;s theme. We&apos;ve presented five chef battles and those floats were the only dessert item we&apos;d ever had. 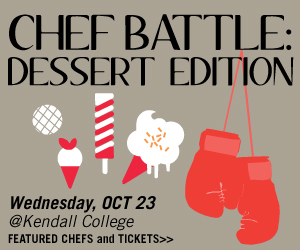 So, this year, we present for your sweet tooth the Chicago Chef Battle: Dessert Edition. Five local chefs will face off in the effort to create the best dessert using Kilogram Teas from Intelligentsia as a shared ingredient. as they spin sugar and butter and flakiness and tea-inspired dessert magic for you from the aforementioned Kilogram Tea and fresh ingredients provided by Whole Foods Market. It all takes place at (in another Why Didn&apos;t I Think of This Before? moment) Kendall College. Complete with Goose Island Beer, Intelligentsia Coffee, wine from The Wine Goddess, and savory snacks (as palate cleansers between ridiculously sweet concoctions) provided by the staff and student chefs of Kendall College, this is three hours of deliciousness that you will not forget. The rules are simple. You buy a ticket. You arrive. You eat one of two desserts (one regular and one gluten-free) from each chef station. You vote for the dish you think is the best. We count the votes. The Afternoon Shift&apos;s Niala Boodhoo (who will be hosting the evening and interviewing our guest jury comprised of Louisa Chu, Monica Eng, Mike Sula and Steve Dolinsky) will then announce both the jury prize and the audience prize. Then you crash from the sugar high and take a nap in the parking lot before you go home and decide to finally join a gym. Tickets are only $15.00 ($12.00 for WBEZ Members and $10.00 for students) and they are on sale NOW! GET TICKETS BEFORE IT SELLS OUT!